Far up a dirt road in a remote Rocky Mountain valley, two Tibetan Buddhist monks in multicolored robes dipped and twirled, enacting an ancient dance describing their homeland's sacred history. Other monks blew trumpets and clashed cymbals, while 2,000 people looked on. The Great Stupa of Dharmakaya, whose 10-day consecration concluded Saturday, was "built exactly according to the Tibetan tradition," said Reginald Ray, a professor of Buddhist studies at Naropa University in Boulder, Colorado. It contains larger-than-life religious statuary and vividly painted mandalas - circular, geometric images that represent the universe. Most important, the stupa contains the ashes of Chogyam Trungpa Rinpoche, a Tibetan exile who brought Buddhist teachings to the West long before the Dalai Lama, Tibet's spiritual leader, achieved the celebrity he now has. 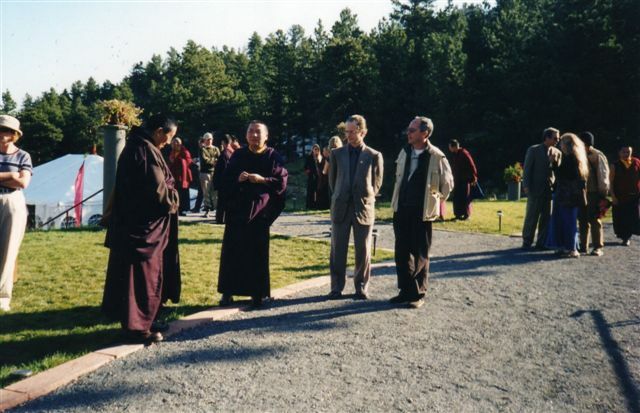 Before his death in 1987, Trungpa Rinpoche wrote a dozen books, founded Naropa and started many meditation centers, including one near the new stupa, the Rocky Mountain Shambhala Center. The stupa's modern features include air-conditioning for its three meditation rooms and a structure of specially mixed concrete intended to keep it intact through 1,000 Rocky Mountain winters, and in a broad sense offers a striking example of how the sacred landscape is changing visually as the United States becomes more religiously diverse. A decade ago, Buddhists from Taiwan built a monastery and temple complex in suburban Los Angeles, the Hsi Lai Temple, which is a landmark of Buddhist architecture in the United States. In contrast, the monument here is the largest project undertaken by native-born Americans who have embraced Buddhism. For some, the stupa symbolizes a new stage in Buddhism's American development. "It seems to me, in the '70s, Buddhism was more of a sect," said Judith Simmer-Brown, chairman of Naropa's religious studies department. By creating such monuments, she said, "we're moving into a culture and a civilization." A stupa is a traditional form, a highly stylized rendering of the Buddha, seated in meditation. "A stupa represents the heart of the Buddha," said Zurmang Gharwang Rinpoche, who traveled to the consecration from Sikkim, in India, one of more than 50 monks to come from Asia. "That means," he said, "when you're close to the stupa, you're close to the Buddha." He and several others were walking clockwise along the gravel path that encircles the monument. By walking around a stupa, a person is said to gain merit and drive off negative forces. "Generally, when you build stupas, it's to remember your teacher," Gharwang Rinpoche said. Born in Tibet in 1939, where he was recognized as the reincarnation of an important abbot, Trungpa Rinpoche fled into exile in India after the Chinese invaded his homeland in 1959. In the mid-1960s, he studied comparative religions and philosophy at Oxford. In 1969, he relinquished his monastic vows and, in a move criticized by his associates, he married a young Englishwoman, Diana Pybus. 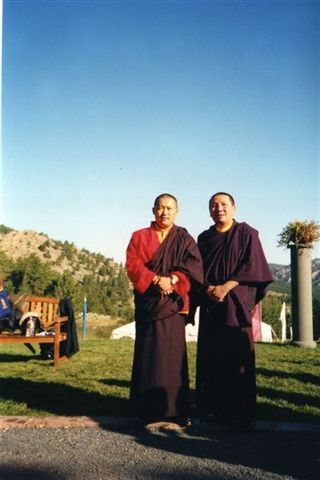 The couple moved to the United States in 1970, where he established meditation and study centers in Vermont, in Boulder, and here, on 500 acres (200 hectares). In one of his most influential books, "Cutting Through Spiritual Materialism," he wrote: "In meditation practice, we clear away the confusion of ego in order to glimpse the awakened state. The absence of ignorance, of being crowded in, of paranoia, opens up a tremendous view of life." He told his students that they should not reject Western culture but claim the best of it. 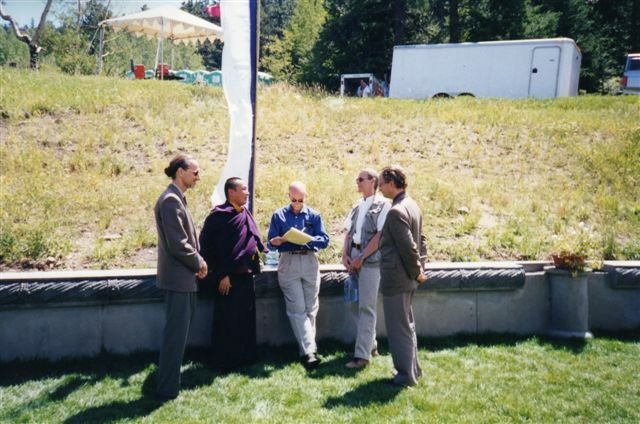 "He was never someone to tell people to walk out on their Western lives," said Mr. Ray, the Naropa professor and the author of two studies of Tibetan Buddhism. "That's the point of the dharma," he said, "to bring it into life, not to leave life." Work on the stupa began after Trungpa Rinpoche died of respiratory and heart failure at 47. 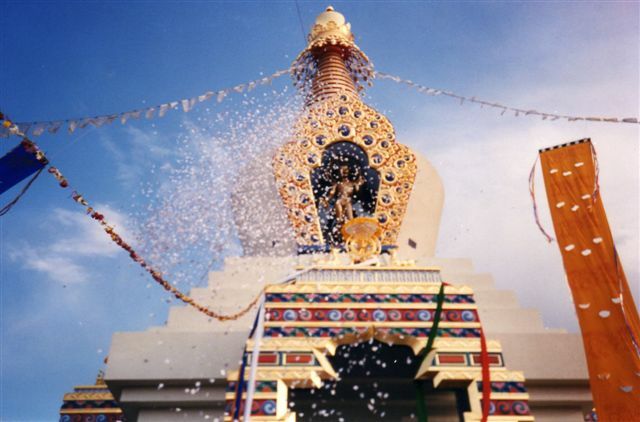 One of his teachers, Dilgo Khyentse Rinpoche, advocated the building of the stupa and gave it a name - in full, the Great Stupa of Dharmakaya Which Liberates Upon Seeing.